Instructions: The blue patterned paper is the background. Cut a small triangle of yellow patterned paper, and a 0.75" strip of the same yellow patterned paper. Find and cut out the dark blue border strip. Adhere the 2 strips of patterned paper to the bottom of the layout. Using the long, scalloped rectangle die, cut one from white cardstock. Cut in half length way. Adhere to the edges of the yellow patterned triangle. Adhere to the top left-hand corner of the layout using crafty foam tape. Die cut 2 of the swirly frame die from white cardstock. Cut 2 small pieces to fit inside of the frames that are 0.75 x 3.25". For more tips on creating with the tags & sentiments, watch the tutorial at https://youtu.be/eAfLuNkRda4. Die cut out the large yellow tag and the yellow tag at the bottom of the layout using the coordinating dies. Run the silk ribbon through the tag at the bottom of the layout and wrap around the back and adhere. Find and cut out the "A Time to Remember" sentiment, mat in white cardstock and adhere to the yellow tag at the bottom. Double mat the 4 x 6" photo in white cardstock. Mat the small photo in one layer of white cardstock. Adhere the 2 matted photos together, slightly overlapping. Adhere to the layout using 3D foam squares. Add the large tag to the top of the matted 4 x 6 and the swirly frames to either side of it. Add a bow of burlap string to the large tag. Using the Leafy Accents stamps and dies, stamp and die cut 1 set of the large swirly leaves, and 3 of the three-leaf image using dark green ink (Seaweed). Add color to the leaves using ink and daubers (Green Apple). Stamp and die cut 2 sets of the medium flowers using blue (Sailboat) and yellow (Crushed Curry) ink. Stamp and die cut 3 sets of small flowers using orange (Spiced Marmalade), yellow (Crushed Curry), and pink (Berrylicious) ink. Add color to the flowers using ink and daubers: Blue (Faded Jeans), yellow (Crushed Curry), orange (Spiced Marmalade), pink (Candy). Stamp and die cut 4 sets of the button images in the following colors: Pink (Berrylicious), Teal (Broken China), Blue (Sailboat), Yellow (Crushed Curry). Add color using ink and daubers: Pink (Candy), Teal (Seafoam), Blue (Faded Jeans), Yellow (Crushed Curry). Using 3D Crystal Lacquer add adhesive on top of all of the button images and let dry.Shape all of the flowers using the 3D Floral Basics Shaping Mold. 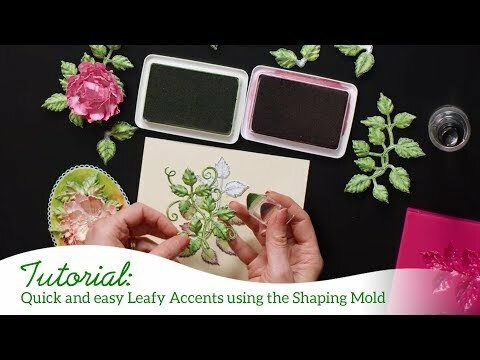 Shape all of the leaves using the 3D Leafy Accents Shaping Mold. 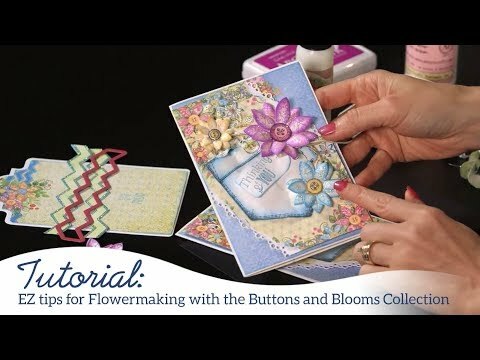 Assemble the layered flowers and add a button to the middle of each using a small 3D foam square. Add the flowers to the layout first. Then add the leaves using adhesive dots. Add a single button to the yellow patterned triangle.